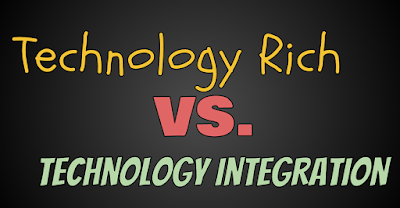 At one of our district TILT (Tech Integration Leadership Team) meetings this past year, it was mentioned in a conversation about some of our classrooms being "Technology Rich" versus a classroom that is truly utilizing technology to where we could say "Technology Integration" was occurring. I've been thinking about this a lot over the summer so I thought I'd throw some thoughts out there and see if others have some ideas to contribute. I work in Franklin Public Schools near Milwaukee, WI. We don't have money growing on trees, but when it has been time to plan for technology, we have been pretty smart about our purchases (budgeting, seeking grants, etc). I've been really proud of our planning for technology as we look at what we want to be occurring in the classroom and then work backwards to find the technology pieces of the puzzle that will get us to that full picture. Not all districts do this. I have talked with others that just make a decision to go buy technology and then figure out where it will fit and I can't think that way. WHAT DO YOU WHANT KIDS TO DO WITH TECHNOLOGY? 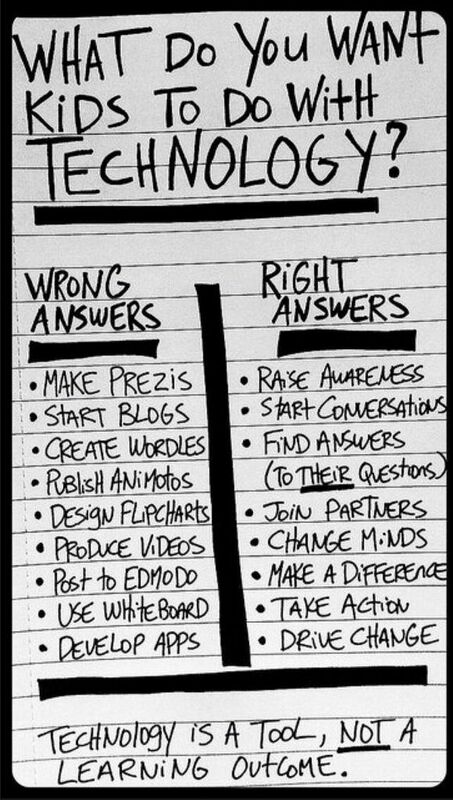 Part of my trying to better define this stems from this graphic that was passed around online a while back from Bill Ferriter that centers on "What Do You Want Kids To Do With Technology?" At times, I will meet with teachers during a team plan or other meeting and ask "What do you want your kids to do? To show? To prove their learning?" Frequently, I will get answers from the left column. "I want my kids to make an Animoto"
"I want my kids to make a flyer." "I want them to blog." Over this past year, our district has shifted to Standards Based Learning so this has forced us all to up our game during conversations like these where they are more streamlined because we have to talk about the standards that a unit of design is going to address. The 'right' column is hard. If you choose "I want my students to make a difference" as an example, there isn't just something quick and dirty you can point to as a solution. We are all challenged to find the right tools, uses and learning to get us to the answers on the 'right' side of the column...or above the red line as has been a mantra in our district the last few years. Back to my purpose for this blog post. 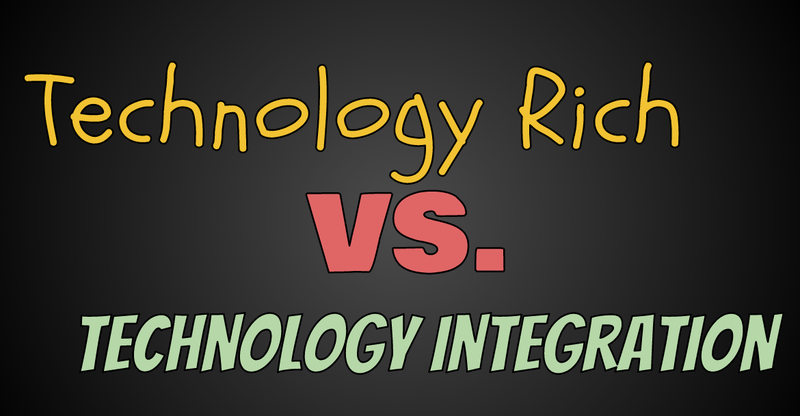 I want to hear from others what you think it means to be 'Technology Rich' in the classroom versus what you think it means to be doing 'Technology Integration.' I'm not quite convinced I have the right terms there so I'm open to changing those. Let me share what my thoughts are and then please respond in the comments. As a caveat, when I say 'tech' -- I could mean both the hardware (Chromebooks, tablets, phones) and the tools (Google Apps, websites, media creation tools). 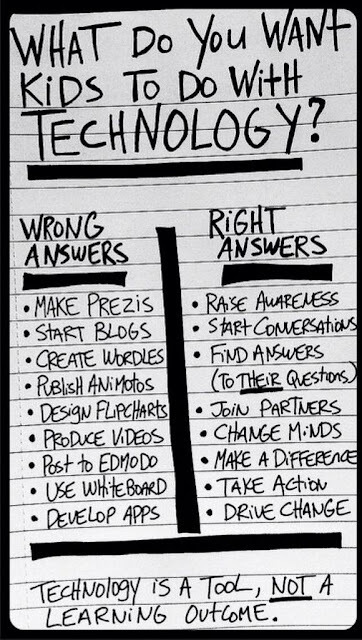 When I'm working in a class, I'm looking for the following to see engagement by students so that I know the technology is being used to almost all, if not all of it's potential. That's where I'm at...I'd love some feedback to help me make this more robust. I'm working with some school districts before school starts and I want to clearly define the difference between these two schools of thought.